Let’s see, what do we have here? But rather than ease concerns about the impropriety of rock ‘n’ roll, we’re presented with the shocking revelation that this young waif thrown into the mix was dragged into a life of depravity as well, turning the slightly suggestive song into something even more overtly sexual in the process! Does any of this pique your interest? No? Okay, no worries. Maybe there’s a website more aligned with the demure musical tastes of 1949 then. At around the same time this one came out I see that Perry Como had just released a lovely song entitled Let’s Take An Old Fashioned Walk which may be more your speed. There’s also plenty of versions of Some Enchanted Evening out right now to choose from… Bing Crosby, Frank Sinatra, or if you’re feeling particularly frisky Gordon MaCrae. And more good news, in a matter of days Al Trace’s much anticipated Swing Your Partner Polka will drop. I know, like most anxious “quality music” fans you can barely contain your excitement. Don’t worry, those of us residing in the gutter will let you be. We’re sorry we can’t stick around to discuss Doris Day’s latest sides with you but, well you see, we have other plans. This isn’t our very time grabbing our tackle box off the shelf and heading down to the water to toss our lines in in hopes of snagging some seafood, but it has been awhile since last we went on a fishing trip in these pages. Way back in November 1947 we joined saxophonist Tom Archia and vocalist Buster Bennett on a very interesting excursion out on the lake to see what was biting and while we didn’t catch a whole lot, like most fisherman know it’s not the catch itself that makes for the best stories, it’s the surely exaggerated tales of the ones which got away. On Fishin’ Pole Bennett gleefully described the salacious details of a recreational pursuit that the Game Warden surely wasn’t handing out licenses for, namely S.E.X. Though the particulars of that tune are more entertaining than we’ll have space to cover in this brief spot, let’s just say the fishing euphemisms themselves got a good workout that day and leave it at that. The topic though is always ripe for revisiting and so here we find ourselves again, shoving off to try our luck once more. The difference is this time the boat we’re in is a lot more crowded because we’re joined by The Five Scamps all jostling for position to sit alongside the only female aboard this craft in Evelyn Twine. Needless to say we may be using a different type bait this time out. Just who is this woman invading the all male sanctuary of fishing boats and dirty songs, you ask? Well, Evelyn Twine was a singer with a female group called the 4 Winds who never had any real luck themselves – musically that is, I wouldn’t know about their ability to lure eager fishermen. Twine was also the sister-in-law of Rudy Massingale, the Five Scamps piano player and saxophonist, which raises some interesting questions in its own right, such as how he broached this subject with either his wife, whose sister’s good name he was seeking to besmirch, or perhaps his brother whose wife he was dragging into this sordid tale with the hopes of using her to titillate the male listening audience into laying down some cash to hear her suggestively talk about her potential bedroom activities on record. That’s one Thanksgiving dinner I’d have liked to have been invited to! But let’s not talk turkey, this is about fish (sort of) and here’s where we have to admit to being more than a little flabbergasted by the entire situation. The fact is, this was a typical story of the major label mindset when it came to assessing the marketplace and trying for hits. Back in April the original rendition of this song was released on tiny Pearl Records by a novelty singer named Dottie Barlow, whose high voice was meant to recall a pre-pubescent girl which frankly makes that version, the POP version, much more disturbing and potentially criminal in nature than The Five Scamps cover of it. While the Barlow record is downright insipid in its delivery, on this cover of it Twine manages to inject the lyrics with a knowing grin which both makes it MORE dirty, yet more honest and therefore more excusable than the silly naïvety Barlow presented it with. The Five Scamps pull this off by highlighting the perceived innocence of the original with as square an intro as possible. It’s one of those faux dramatic lead-ins beginning with “Once upon a time” as Twine is setting this up almost as a quasi-fairy tale. Then of course they pull the rug out from you as the pace jumps into a jaunty clip, Massingale’s piano taking the lead while hand claps propel it along as Twine, showing an excellent voice for someone who reputedly was nothing more than a local club singer with her own group, shifts nimbly into gear as she states plainly what her mother warned her about – namely men – and how they’re out for only one thing. Now before we GET to that thing we need to try and convey just how damn enjoyable this all is… the song I mean, not the… uhh… “fishing” (though that’s plenty enjoyable too, don’t get me wrong!). Twine is ostensibly portraying a young girl here, maybe a 16 or 17 year old, or fearing prosecution if the age of consent is a little higher in the state you’re listening to this in we can say that she’s an inexperienced 19 year old. The point is to sell this properly she has to come off as a little naïve without sounding immature or childish as Barlow did which only makes it creepy. That’s a fine line to walk but Twine pulls it off with surprising grace, her tone is very polished yet her subtle shadings give off the impression that she’s not quite as mature as her voice suggests. In other words, she’s singing as if she’s not aware she’s as talented a vocalist as she really is, which works well on a song in which she’s embodying a girl who’s not yet aware she’s as desirable as she obviously is when a boy asks her to go “fishing” with her. The Five Scamps may hope not to be incriminated by any of this but they too get caught up in the ebullient spirit she projects, echoing each stanza’s last line in a seductively harmonious way, the back and forth trading off making them complicit in this seduction whether they like it or not. You can hardly blame them because it’s so infectious and before long you’ll start joining in with them in sing-along fashion yourself. Novelty songs are virtually doomed to never be taken seriously by any true music lover because they’re designed to be simple, even simplistic, but this take on The Fishing Song is catchy as can be. Considering that Barlow’s original was not catchy at all despite having the same lyrics and musical framework, it shows the skill level of The Five Scamps and Twine who imbue this with the proper underlying attitude to transcend its origins completely and make it a nice fit in something as perverted as rock ‘n’ roll has a reputation for being. The topic though ensures that no matter how much fun you’re having you better make sure have bail money ready in case Child Welfare is lurking nearby. Here’s where you expect it to slip up. The lyrics. In fact it’d be almost more shocking if it didn’t fall short in this area. A song like this, meant to be just racy enough to draw curious interest yet still modest enough not to draw censure was bound to lean too far in one direction, probably the mild side of the equation to make absolutely sure it doesn’t even skirt the edge of scandalous. So imagine your surprise when it does no such thing and actually gives a pretty good rundown of the pitfalls of letting guys take you out in their rowboat. That’s why mama said I shouldn’t go fishing with you! And Papa had more than fishing on his mind! The lines are so well conceived, smart and clever, in perfect cadence and with punchlines that make you laugh at first listen but once you’ve absorbed them they still hold true which allows them to still be enjoyed even when you know the zinger that’s coming next. 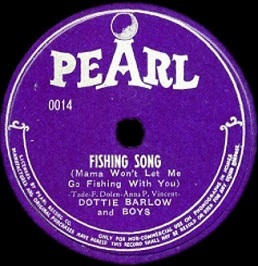 The Barlow version presents it straight, forcing the listener to interpret the meanings as she remains both above it all by refusing to acknowledge the reality of it (until the coda) as well as beneath it by making it stereotypical and downright racist using “Mamie” rather than “Mama” which The Scamps use, and showing Twine to be far smarter than the stereotypical interpretation of Barlow. When Twine and Earl Robinson, the Scamps regular lead, trade off in the semi-spoken bridge it runs the risk of going for laughs too much, as he is attempting to talk her into going against her mother’s wishes and her own better judgment as Evelyn remains adamant in a stubborn girlish way that she wants no part of his bait. Yet as close as it veers to excess in the concept they manage to pull it off without derailing the musical momentum at all, somehow allowing you to overlook the shift in delivery and just take it as you might a sax or piano solo, something that gives it a different feel but fits into the larger framework. It’s amazing that for all of the ways this COULD go wrong, and probably SHOULD go wrong, especially considering that it’s coming out on a record label that was so stiff in their worldview that they probably served only pasta and mashed potatoes for lunch in the company’s cafeteria to ensure all of their employees had enough starch in their diet to suit Columbia’s image, that it manages to sidestep every potential pitfall. Much of the credit has to go to Twine, who we haven’t met before and won’t run into again, who never betrays her acting job here and as a result the others fall in line with just as much conviction. If you want to criticize it for something you can call them on swiping a bit of the melodic feel from the recent Paula Watson hit A Little Bird Told Me which Evelyn Knight covered for the pop market and had a huge hit with, something which the folks at Columbia might’ve been more focused in this instance as well, allowing them to overlook the specific content of the record. But whereas “A Little Bird…” was innocent, The Fishing Song uses innocence as a deception to sell the real story, kind of like how IN that story the guys use deception to try and convince Twine to believe their assertion that they really DO just have fishing in mind. At this point, even if you’re a determined fisherman, you have to admire Evelyn AND her mother for their resistance. 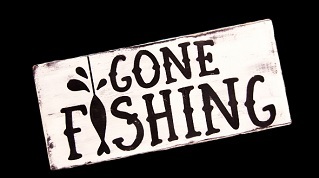 They’re going to stubbornly avoid whatever shiny lures are floating on the lake’s surface and instinctively head for deeper waters, determined not to wind up on some guy’s hook being reeled in and served up on a plate for dinner. 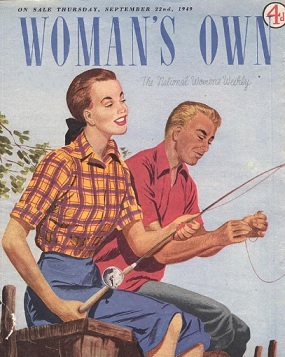 But while I personally think fishing – for actual fish, not women – is a boring way to spend a day, I have to admit this particular excursion they’re singing about might be worth chartering a boat and heading out in pursuit. This sure isn’t something The Five Scamps could build upon if it did find an audience, especially as Twine will return to her day job (and presumably stay on dry land) after this. But while The Fishing Song itself may be so unclassifiable as to resist rewarding it with the highest marks in a pure rock setting, that doesn’t mean it’s not an unexpectedly enjoyable dish all the same. 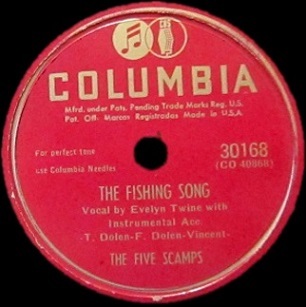 Leave a reply on "The Five Scamps: “The Fishing Song”"